I don’t know about you, but I like blogs and websites that take me behind the scenes and give me something of a personal glimpse into the life and thoughts of the main character. It can’t be a replacement for the meat on the bones: like most people, I expect good content first. But provided the content is there, and well presented, I’m happy to indulge a bit of soul baring and storytelling from time to time. Now, hold that thought while I tell you that being a captain of your own website – even a small (but growing!) one like The Pie Academy – is already a lot of work. Whipping out bulky cameras and good writing takes time – time I want to spend on “meaty” content first. But if my loyal Pie Academy members would be willing to cut me a little creative slack and allow for some down-and-dirty, journal-like posts using nothing more than my iPhone camera and the first words that come to mind, this could be fun. So let’s give it a try, fully expecting that this – my first one – will be nothing short of lame. Take this photo, for instance. I’ve been batch-ing it for a few days. 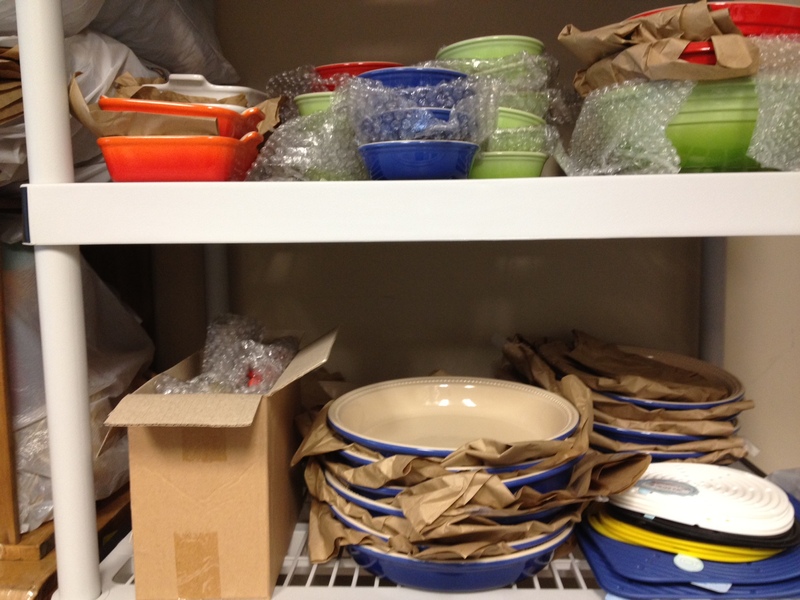 I’ve had my caveman moments, but for the most part I’ve been engaged in mundane-but-essential tasks like inventorying my stash of Le Creuset pie plates, pie birds, etc. 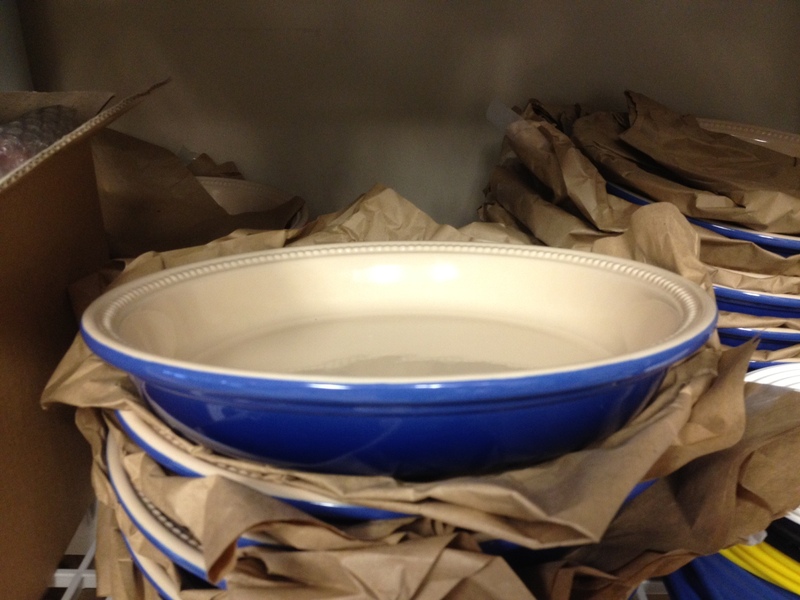 I’ve got a lot of it, all for sale at great prices, none of which I love as much as these outsize ceramic pie plates. I’ve sold some of these, but I think the size – they’re a full 12″ across from edge to edge – may have scared away some pie makers. Depending on the pie you’re making, you’d almost have to double the recipe. I’m thinking of creating a special give-away e-cookbooklet of Thanksgiving pie recipes, sized to this pan, for anyone who purchases one. As incentives go, does that appeal? Tidying up my shelving made me feel so virtuous I decided to take on the freezer. It was not an option. My wife Bev is the Queen of Freezing so our freezer typically looks like the back of a Schwan’s truck on a busy delivery day. 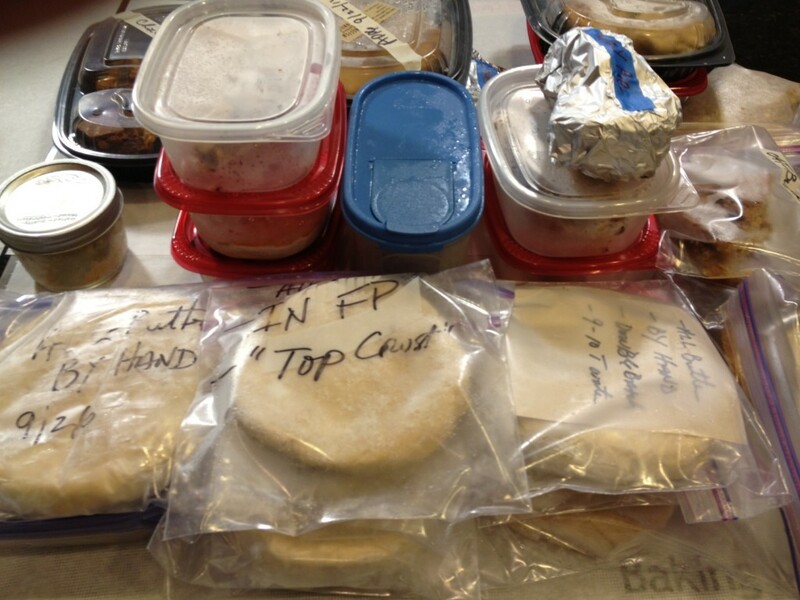 Here’s about a week’s worth of frozen pie slices, pastry and other pie stuff awaiting repatriation to Siberia. That jar on the left is a pecan pie baked in a Mason jar, for a new video course I’m doing on individual pies. It’ll be ready this winter. Here’s a better view. Speaking of courses, my much anticipated pie pastry making video course is still in the works and getting there – a little slower than I had hoped due, among other things, to my obsessive testing and retesting of the recipes and tweaking of the videos. 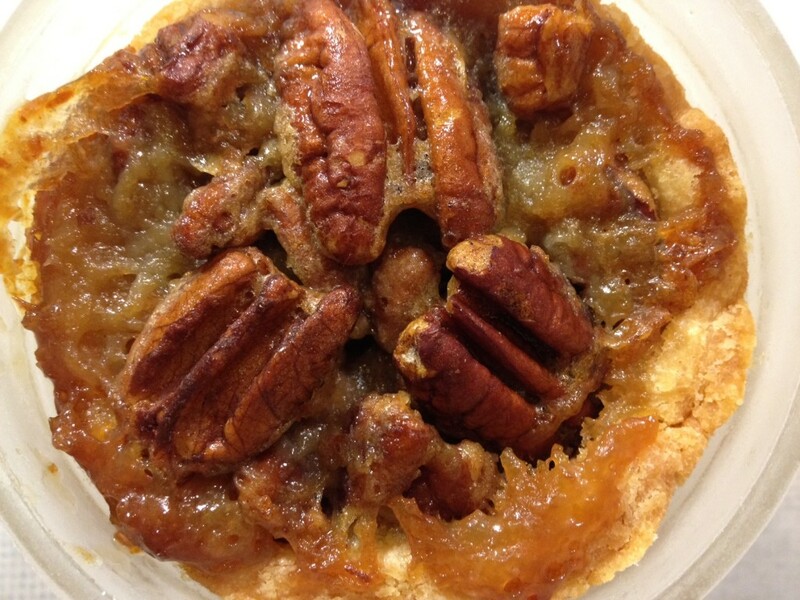 I know how much some people struggle with pastry making – just today I had yet another email from a woman with an epic fear of pie dough making – so I want this course to be pretty much the be-all, end-all for the pastry phobics of the world. 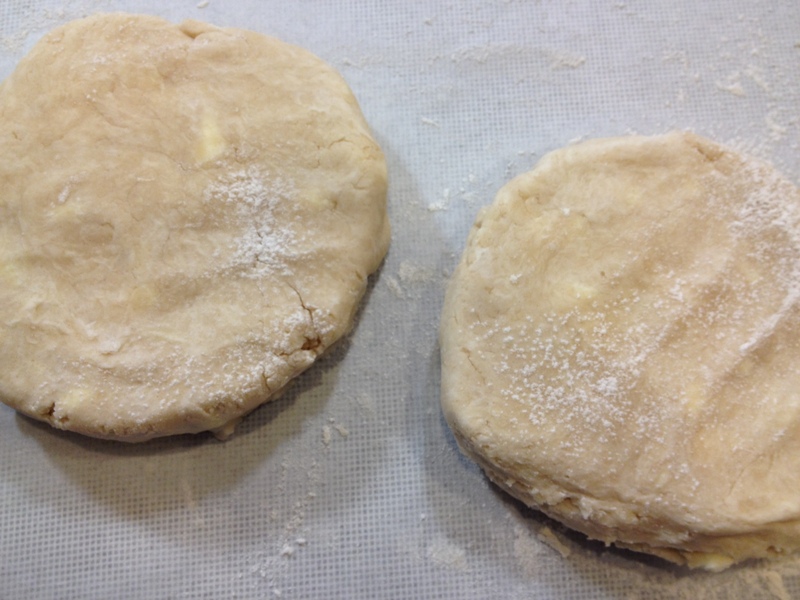 One of the recipes featured in the course is Dad’s Pastry, above. This double batch was made in the food processor. I’ll wrap it up and then stick it – where else? – in the freezer until I need it.